I've seen a bunch of awesome spooky egg bentos lately. The creepy eggs & fingers from Sonoma Bento are amazing and these little skull eggs from Sheri at Happy Little Bento just might be my new favorite thing ever. Miss Faith has a witch egg with an orange cheddar hat (white cheddar band) and cucumber features. In retrospect, I should have added hair, next time! The egg is resting on some carrots and has a pet bat that is resting on a roast beef & cheddar sandwich on Nature's Own Multigrain Rounds. The left side holds a plethora of cantaloupe and a couple of fresh strawberries with my spooky Halloween pics. Absolutely too cute!! I love the witchie egg! So cute, I love the witch egg face! And the lunch is nice and balanced with protein, fat, and carbs. Thanks for the nice mention. Creepy eggs RULE! Where you do get your picks from? I finally put some grapes on plain toothpick for my son today for some cuteness. I would like some fun holiday and everyday ones too (and reusable). Hi from SITS! Cute site you got here. 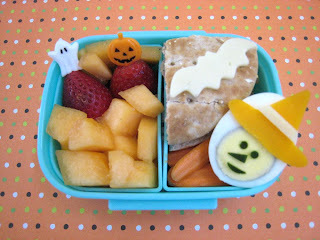 These bentos are so creative! what a cute idea to use half egg as witch.. Love it!